A customer recently needed a system to move variously sized cartons through two inkjet printers. During this process, the carton needed to be justified and then transferred 90 degrees. To accomplish this Dorner provided them with a 6 conveyor system which included three 3200 Series Conveyors with Intralox’s patented Activated Roller Belt (ARB) technology, one of Intralox’s DARB conveyors and two 2200 Series flat belt conveyors. With up to 8 different sizes of cartons moving through the system, the customer needed conveyors that could handle variously sized without the need for changeover. Cartons will enter onto the Intralox DARB conveyor with the short edge leading from an upstream carton taper. If the carton has not been taped properly, the reject system will activate and the DARB unit will perform a 90° transfer, moving the box down a curved skate wheel conveyor. If the carton has been sealed properly, it will continue onto a 3200 Series conveyor with ARB technology. 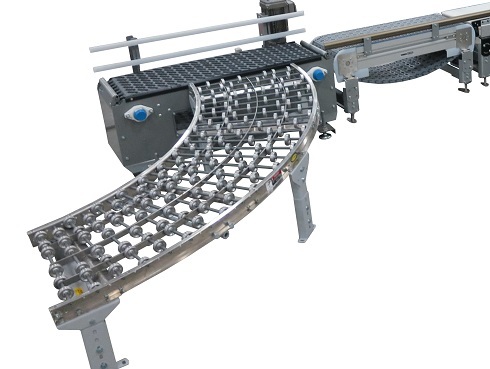 This conveyor uses Series 400 30° Chain and Activated Rollers to justify the carton against the edge where the printer is located. After justification, the box is transferred onto a 2200 Series conveyor to allow for smooth labeling on the side of each carton with the inkjet printer. The 2200 Series conveyors are used because the rollers on the ARB conveyors would not provide a smooth enough surface. Next, the carton travels to a 3200 Series conveyor with ARB technology using Series 400 45° Chain and Passive Rollers. This conveyor, along with the end roller guide, provides a 90° transfer onto a second Dorner 2200 Series conveyor. Here, another inkjet printer prints information on the end of the carton. Finally, the cartons are transferred onto a 3200 Series with ARB technology conveyor which utilizes a bump turn to reorient the carton direction back to leading edge.